Features include camp shirt styling with short sleeves, coconut buttons and a matching left breast pocket. no bleach, line dry, use cool iron. 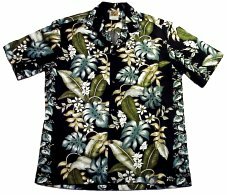 Great for Theme parties, Family Reunions, Casual Fridays, Luaus, Clubs, Pep Squads. Inquire about our Bulk Ordering. Shirt availability varies with style, size and color. May take 1-3 days for availability and 7-14 days for manufacturing if bulk material is available. Aloha! May We Help You? If you need assistance or more information, please contact us for service with Aloha! Please indicate if this is a gift in the message box when purchasing. © 2000-2006 Waikiki.com. All Rights Reserved.